Heat the oil in a medium saucepan over medium-high heat until hot but not smoking. Add the rice and cook, stirring often, until it becomes milky white, crackles and feels heavier as you stir it in the pan, about 3 minutes. Make room in the center of the pan, add the onion, garlic and chile, and cook for 2 to 3 minutes, stirring and mixing with the rice, until the onion begins to soften. Add the chicken broth and salt and stir once. Raise the heat to high, bring to a rolling boil, add the chepil leaves, stir, cover and reduce the heat to the lowest setting. Simmer 12 to 15 minutes, until most of the liquid has been absorbed but there is still some moisture in the pan. 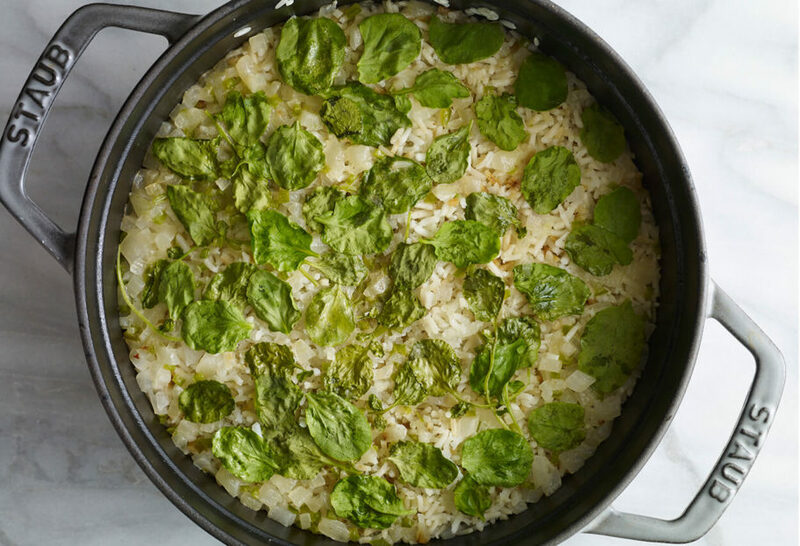 The rice should be cooked and tender; if it is not, but all the liquid has been absorbed, add 2 tablespoons of water, cover again, and cook for a couple more minutes. Remove from the heat and let the rice rest, covered, for 5 minutes. Fluff the rice with a fork, and serve. Best tasting rice I’ve ever had! I found frozen Chipilin in my area. So glad you loved it, Tammy. I am a ‘nortamericana’ who lived in Mexico for 10 years now residing in SoCal. I love your show and ALL your recipes. This meatball quajillo sauce over white rice chipilin was SUPER popular with the men & boys-especially sprinkled with queso fresco or anejo and served with toasty little white corn tortillas to scoop up the rice and gravy. Double it AT LEAST! I’m so happy to hear that, Cynthia! yup that is it! thank you so much. For the leaves can you substitute spinach leaves? Where would I find chapil? I live in East Texas, is there a way to buy it online or would a Mexican grocery carry it? this is my family new favorite when made with Jasmine rice totally fantastic! the meatballs were awesome. Thank you for the recipes and your diligence to educate us on the different regions of Mexico. Thank YOU for trying so many recipes Martha! Whats a good substitute for the Chepil? Thanks. You can substitute it with baby watercress. Soy Mexicana y vas a creer que nunca había escuchado sobre el Chepil!!!!! Quiero preparar esta receta mañana, tendré que sustituir el Chepil, no creo encontrarlo aquí en MN. Pati, I saw this recipe on your program!! I would love to know where you get those beautiful tips you wear on your show!! It’s a delicious herb with a grassy taste. It’s like a mellow version of spinach or a gentle variation of watercress with a silky delicate bite. Yum! Big fan of your cooking. I would like to know regarding the chiles that are put into the arroz con chepel.. I will have children eating this dish, so my question for you is if the rice will be spicy? Should I remove the chiles or only use one? Thank you Sofia! You can use serrano or jalapeño chiles in the rice. The jalapeños will be less spicy, and you can remove the seeds and ribs to reduce the spice level. You can also use fewer jalapeños or remove them altogether so that the spice level is right for your kids.